THE WRITING BUDDHA - Opinions | Books | Movies: Destiny of Shattered Dreams by Nilesh Rathod (Book Review-4.5*/5) !!! 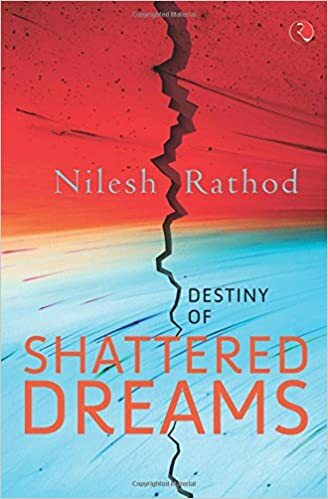 Destiny of Shattered Dreams by Nilesh Rathod (Book Review-4.5*/5) !!! I spent my whole Saturday in reading the debut novel written by Nilesh Rathod named “Destiny of Shattered Dreams”. He is a businessperson, writer and poet. He is also the co-founder of Ensemble Infrastructure India Limited which currently employs over 2000 people. While reading the book, it made me feel that most of the parts are influenced from his real life experiences as the plot of the book is about a middle-class boy who turns into an entrepreneur after which several unfortunate events start taking place in his life because of the decisions he takes. The book is published by Rupa and I feel it is one of their best releases this year in the fiction category. Nilesh Rathod’s writing style is amazing and no way has it looked as if a debutante author has written this kind of thriller book. It cannot be called as thriller but it’s a perfect page-turner as events keep unfolding and the reader will remain excited to know what happens in the next page. I liked the pace of the book with which the author has written right from the start to the end. The opening scene shows the protagonist in the jail where he is sharing his life story with the inmates because of which he ended up being behind bars. The story consists of love, romance, ambition, blood, glory, success, failure, politics, entrepreneurship, friendship, philosophy, poetry, marriage, extra-marital affair, depression etc. The first half is more about how the protagonist is forcibly made to invest money in his business from illegal sources because of which he gets affiliated with the corrupted politician. The 2nd half is more about the protagonist’s struggle to clean the image of his company and the insight in his personal life. The book is exciting and makes you feel for the protagonist who gets trapped in the entire web just because he has an ambition to see his organization succeed and grow. The book tells about how a person gets trapped in the situations even after he knows that it will cause trouble later on but he has no option other than choosing that particular option itself. The last 20-30 pages where the author narrates protagonist’s destiny of shattered dreams brought tears to my eyes and I suddenly started feeling very lonely. The effect that the last pages have done to me is unforgettable and therefore, this is going to be one of the most special books I read. I believe that the author can write great thrillers like Ravi Subramanian. I am just expecting his next to be the same. I give 4.5* to this book. A great book indeed!